HAMILTON COUNTY, Ohio -- Four new four-legged officers will be patrolling the streets in Hamilton County. After 14 weeks of training, the newest class of K9 officers -- and their human handlers -- graduated from their own police academy Friday. 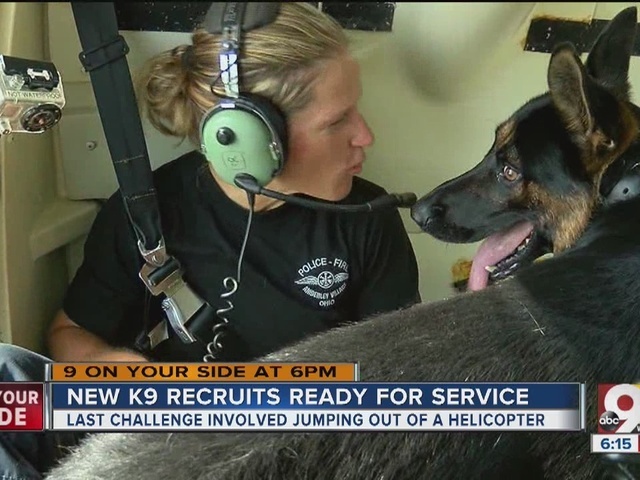 Two of the K9 officers will work for the Hamilton County Sheriff's Office, one will work for Cincinnati Police Department and the last will serve the Amberley Village Police Department. "I would put these dogs up against any dogs in the United States," CPD K9 trainer John Neal said. "These are brand new dogs, but they are amazing. Their work ethic is amazing, they can do the work of 10 officers." One of the dogs' toughest tests was the helicopter jump. "Let's say we have a dog working in the city that's on the west side of town. And let's say Clermont County, they have an escaped inmate from the prison," Neal said. "The helicopter can pickup the dog and the handler and fly them out there." Not only is the jump itself challenging; the dogs need to know how to work on the ground with a chopper flying above. One K9, Creed, of Amberley Village, needed some extra guidance from his handler, Andrea Alt. "(The chopper) was loud. He didn't quite know if he was to trust it or trust me with it," Alt said. "He got in the air, he got comfortable and he was kind of watching me and making sure it was okay. I was kind of getting him pumped to get out and getting ready for what we were going to do. And he knew once we got out what his job was."